We spend a lot of our time here at the Pacific Honda blog talking about new and upcoming models because, to be perfectly honest, that’s what the majority of our most loyal readers really care about. Sometimes, however, there are Honda stories worth covering even though they have nothing to do with a specific model. In this case, we’re talking about Project Drive-In, an initiative Honda set up to save as many American drive-in theaters as possible. *Manufacturer’s Suggested Retail Price (MSRP) excluding tax, license, registration, $790 destination charge and options. Dealer prices may vary. Honda delivered a 2014 Accord Plug-In vehicle to the city of Torrance yesterday as a continuation of Honda's advanced vehicle testing efforts, a critical component of Honda's measured approach to furthering its advancement of electric-drive vehicles. The Accord Plug-In, which is EPA-rated to operate in electric-only mode for 13 miles before transitioning between gasoline-electric hybrid and gasoline modes, will join the Fit EV in providing Torrance with in-city transportation options that reduce CO2 and tailpipe emissions. "Honda's continued relationship with the City of Torrance through our advanced vehicle testing has been instrumental in advancing our sustainable transportation solutions," said Center. "Through real-world feedback of the Fit EV and now the Accord Plug-In, the City of Torrance plays an essential role in the refinement and evolution of electric drive vehicles and, ultimately, the expansion of customer adoption for this technology." Over the past year, Honda and the city of Torrance have worked together to collect real-world input from the city's use of a Fit EV test vehicle. After driving more than 7,500 miles in combined city and highway driving, city employees, using the Fit EV for everyday business, were able to surpass the Fit EV's adjusted Environmental Protection Agency (EPA) mile-per-gallon-equivalency rating of 132/105/118 MPGe.1 By driving a Fit EV, Honda estimates the city of Torrance was able to reduce its CO2 emissions by roughly 74 percent when compared with a gasoline-powered vehicle, such as the Honda Fit. "The City of Torrance is proud to continue its partnership with Honda where we jointly hold the keys to a compelling solution for reducing CO2 emissions," said city of Torrance Mayor Frank Scotto. "We have been impressed by the potential of the Fit EV to significantly reduce the city's CO2 emissions from transportation and contribute to our CO2 reduction goals. The addition of the Accord Plug-In will help enhance our efforts to reduce CO2 from the city's operations." The EPA-rated 115 MPGe2 Accord Plug-In is the most fuel efficient sedan in the U.S. and is available at select New York and California Honda dealers. 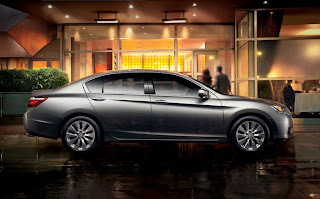 Based on the Touring trim level of the standard Accord Sedan but featuring unique styling cues, the 2014 Honda Accord Plug-In blends the athleticism and craftsmanship of the all-new Accord platform, combined with hybrid efficiency and electric torque. 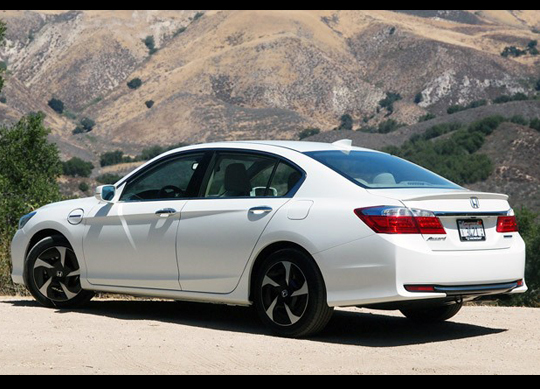 In addition to being Honda's first plug-in hybrid electric vehicle, the Accord Plug-In is the first production car in the U.S. to meet the new, more stringent LEV3/SULEV20 emissions standard, and also qualifies for single-occupant carpool-lane access in California. The plug-in Accord can be fully charged from a low-charge indication point in less than three hours using the supplied 120-volt charger when plugged into a standard 120-volt household electrical outlet (use of a dedicated GFCI outlet is recommended), and in less than one hour using a 240-volt "Level-2" charger3. For more details about the Accord Plug-In Hybrid, please visitwww.hondanews.com. 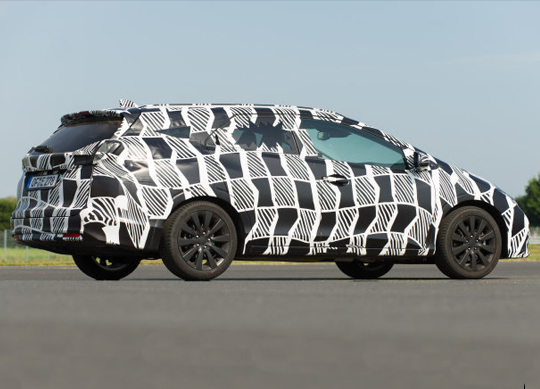 As part of its advanced vehicle testing efforts, Honda has loaned Fit EV's to the City of Torrance, Stanford University and Google to gain valuable feedback on the performance of the vehicle and to further initiatives such as research into human interaction with electric vehicles. 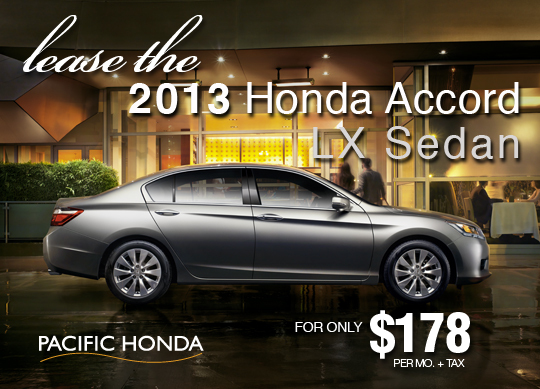 Honda has now added the Accord Plug-In to the program with its loan to the City of Torrance. In addition to producing the Accord Plug-In, Honda has developed numerous technologies to improve fuel efficiency and reduce CO2 emissions, including the Honda Fit EV, Civic Natural Gas and the Honda FCX Clarity fuel cell electric vehicle (FCEV). Honda has also led the Union of Concerned Scientists (UCS) rankings of overall vehicle environmental performance since 2000, and numerous Honda vehicles have earned top green scores from the America Council for an Energy-Efficient Economy (ACEEE) list of America's greenest vehicles for 16 consecutive years. For decades, the Civic has been one of our brand’s best-selling models, and was long before top-notch safety scores were a high priority for American consumers. Of course, today’s Honda customer cares very much about things like the crash tests performed by the Insurance Institute for Highway Safety, and of course, the 2013 Honda Civic is still a best-seller. 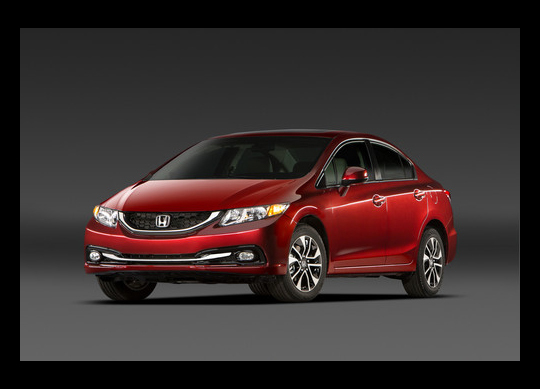 What has allowed it to stay that way, however, are accolades like the IIHS’s “Top Safety Pick+,” which the new Civic was recently awarded. The 2013 Accord has received numerous accolades, including an unprecedented 27th Car and Driver "10 Best" title for the model, as well as an Automobile Magazine All-Star award, a Best Family Car award from Parenting magazine andEdmunds.com, and Best New Sedan Under $25,000 status from KBB.com. 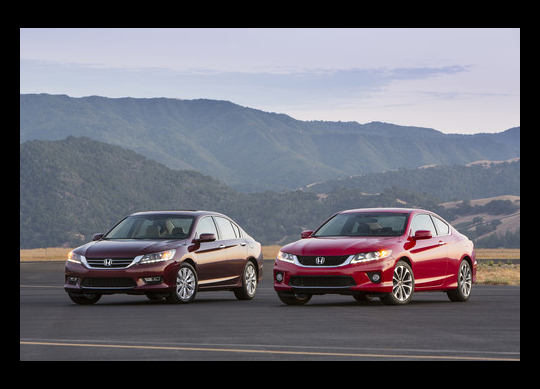 The Accord also topped the competition in a six-way midsize sedan comparison test by Cars.com, USA Today and Motorweek, and was found to have the highest resale value in its class by KBB.com. The Accord's Earth Dreams Technology 4-cylinder and V-6 engines were also chosen as among the 10 Best Engines of 2013 by Ward's. 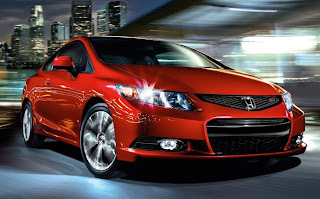 To be completely honest with you, there are a lot of cars out there to choose from, including hundreds of models that are not made by Honda, and the most crowded segment of automobile is the midsize sedan, which just so happens to be where our best-selling 2013 Honda Accord resides. Knowing there is not only this much competition within the segment but also within the industry as whole, you would think that it would be easy for the Accord to get lost in the shuffle. Honda has announced a $215 million investment in a pair of its Ohio operations, taking its total tally for North American operations up to $2.7 billion in three years. The announcement was made at the 2013 Center For Automotive Research Management Briefing Seminars in Traverse City. $180 million of the investment is earmarked for Honda's Anna, OH engine plant. The money will allow the facility to increase its aluminum die casting and increase production of Honda's Earth Dreams Technologyengines. Think of Earth Dreams as sort of like Mazda's Skyactiv line, only ED is limited to a new line of engines, rather than a full suite of automotive components. Anna will also be getting a new technical center to train engineers, techs, and line workers on powertrain technology. The remaining $35 million is slated for Honda's main Ohio operations in Marysville. 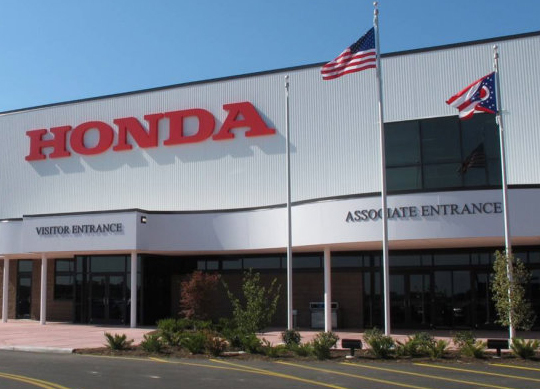 A 160,000-square-foot facility will be constructed near Honda's current properties, which will house another technical training center to focus on automotive manufacturing. The new building will also house Honda's North American Services group, as well as a new heritage center. Every Lemon Grove Honda dealership remembers the Honda “Cog” commercial like it was yesterday, and with good reason. 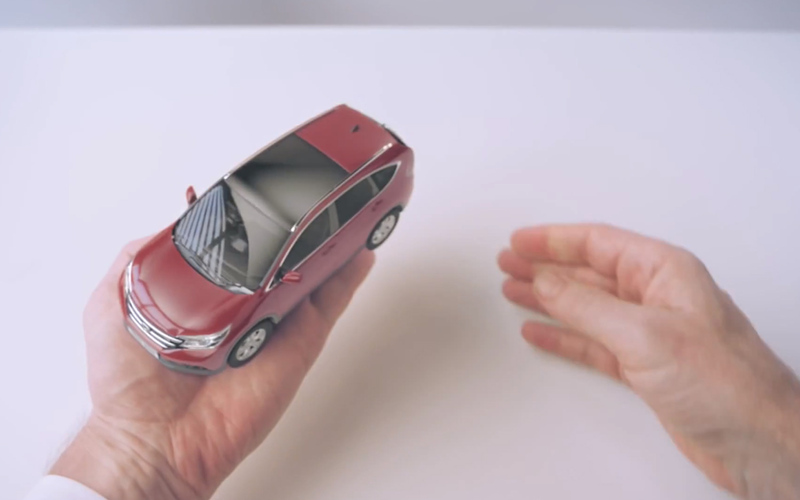 Really good Rube-Goldberg machines are impossible to look away from, and when one features loads of recognizable bits from Honda vehicles, the end result tends to be even more memorable. Honda will be bringing its new Civic Tourer to next month's Frankfurt Motor Show, just as we predicted in our spy shots of the new MPV from back in April. The new model, which will arrive in European dealers in 2014, will be built alongside Honda's Euro-spec Civic hatchback, Jazz (Honda Fit) and CR-V in Swindon, Wiltshire, UK. Honda first hinted at the Civic Tourer with a concept at the 2013 Geneva Motor Show, which is set to do battle with the Toyota Auris and Volkswagen Golf in the European market. 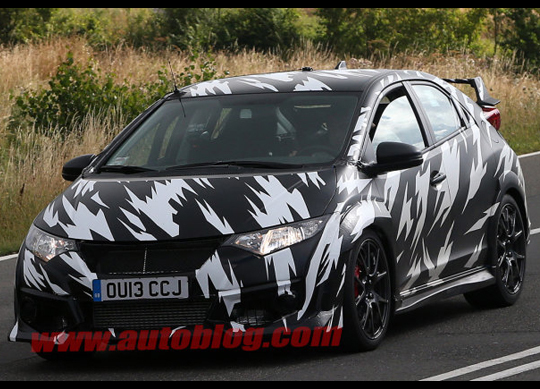 The production Civic Tourer will also be shown alongside a refreshed Civic hatchback, yet another NSX Concept variant, a McLaren MP4/4 Formula One car, and Honda's World Touring Car Championship Civic. 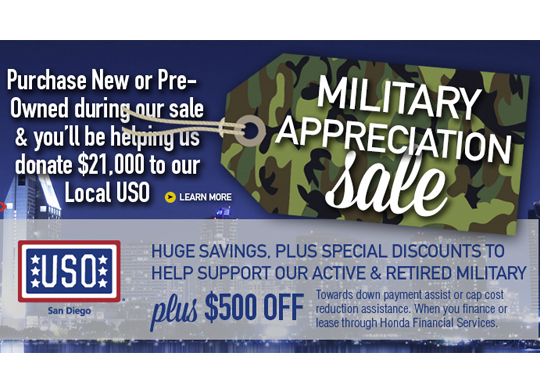 Come down to Pacific Honda and see how your purchase of a new or pre-owned Honda will help with the donation of $21,000 to the local USO! What a great way to say thanks to our troops!! American Honda Motor Co., Inc. today reported July 2013 U.S. sales of 141,439 units, a total increase of 20.9 percent compared with July 2012 (up 16.1 percent based on the Daily Selling Rate, or DSR*). The Honda Division posted July 2013 sales of 126,289 units, an increase of 21.3 percent compared with July 2012. Acura Division U.S. July sales of 15,150 units jumped 18.1 percent compared with July 2012. "In July, all of our core models - Civic, Accord, Odyssey and CRV - showed double-digit gains," said John Mendel, executive vice president of sales at American Honda. "This indicates Honda's commitment to retail sales is resonating with consumers seeking not only fun and fuel-efficient vehicles, but also products that retain their long-term value." "The all-new MDX is off to the kind of dominating start we expected, teamed with RDX to give Acura a powerful 1-2 punch in the important luxury light-truck segment, and new momentum in Acura showrooms," said Jeff Conrad, vice president and general manager of Acura sales. "MDX delivers due to its fundamental advantages in areas that resonate with luxury SUV shoppers." *The daily selling rate (DSR) is calculated with 25 days for July 2013 and 24 days for July 2012. Year-to-date, the DSR is calculated with 178 days for 2013 and 178 days for 2012. All other percentages in release are unadjusted; see table for adjusted DSR figures.